After painting my hills I felt like it was time to update my collection of trees. The ones I’m using are primarily aquarium decorations with flock on them and while they work okay they look a little odd. They might look better mixed with more conventional looking trees or they might need to be scrapped entirely, we’ll see once I have some better tree models to mix them with. Whatever the case I don’t actually have enough trees to do a decent job of filling in forests. No matter what, I need some more trees. 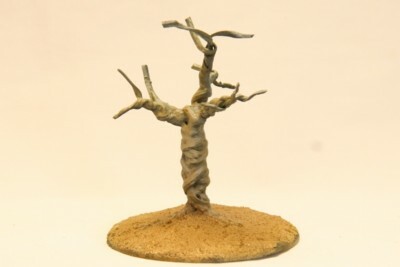 Over the past week I have been playing with making trees from twist ties. Here are two test models I’ve put together. The bases need a drybrush and some flock, but that’s not really the point. The first one is a living tree. 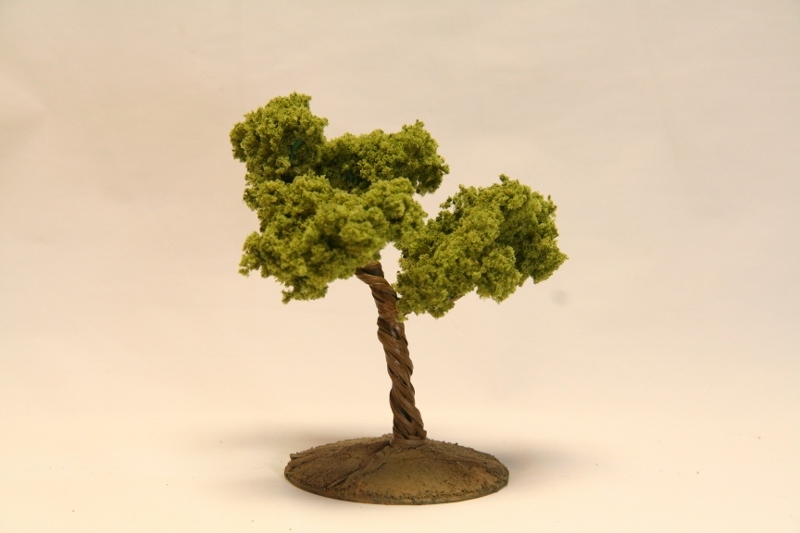 It’s the third armature I made and I was happy with the shape so I painted it up and added some clump foliage to it. 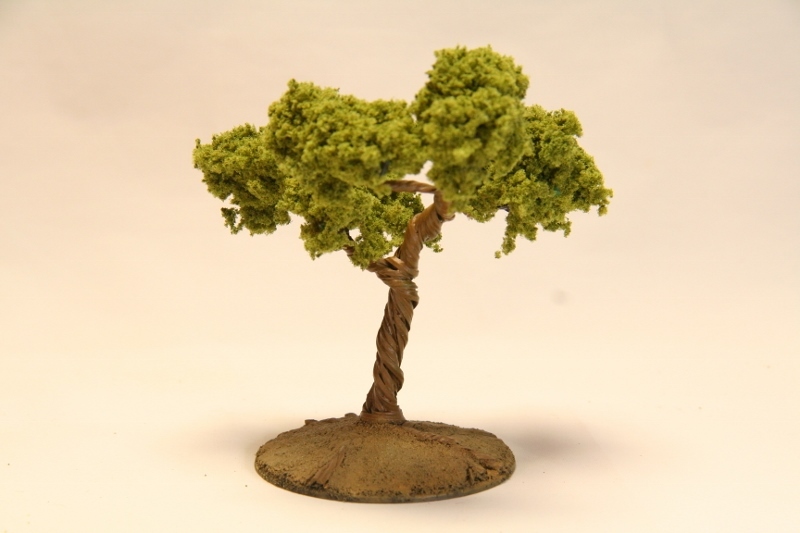 The next tree was actually the second armature I made. After painting the first I felt it could have used a little fill around the armature. As you can see, the filler does a good job of closing any gaps but it still leaves some of the wire shape showing through which gives the tree a nice, gnarled look. I painted this one as a dead tree instead of adding foliage. I think I’ve narrowed in on my process for tree making. 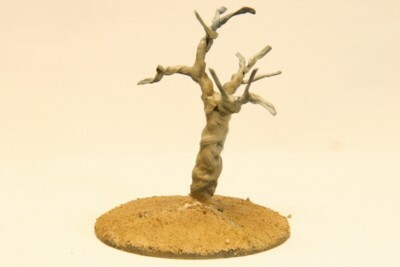 I like the live tree better but the dead one shows how well the filler works so going forward I’ll make the armatures more like in the live one but with filler added before paint and foliage. I’ll also make some more dead trees but I probably won’t leave as many smaller branches at the ends for those. I didn’t take any DIY shots of these but now that I know how I’m going to make them, I’ll make a tutorial later. So that’s two trees down and plenty more to go! How do you think they look? Anything you would change? That post title is a tongue twister! These look great. I’d never have thought to use twist ties but they make a rather convincing tree. The tree roots I think really make it; great touch. A tutorial would be be great. I found a website selling hand-twisted wire trees and it dawned on me that I could probably do the same. The roots improve the look of the tree and they’re also how I’ve attached it. Imagine that, the roots are holding the tree up! Can you take some photos of the actual tree construction? I’m super curious here! I’ll post a tutorial for these. Must know how to make these. 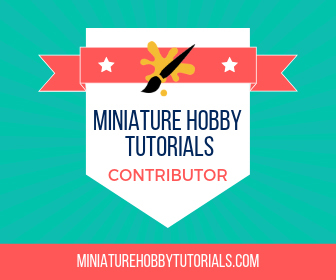 Awaiting tutorial! I like the trees. Makes me want to do some myself.